With the rise of new academic standards, more rigorous educator evaluation and support systems, and a growing population of students who need additional supports, expectations for public school teachers are rising and, in turn, so are expectations for school leaders. Principals are increasingly expected to focus on “instructional leadership” by engaging more deeply in areas related to curriculum and instruction, including assessing and developing teacher practice. However, even if principals are comfortable with and capable of taking on these new responsibilities, many of the other roles principals have traditionally been responsible for have not yielded to make way for these new demands. Principals are still largely expected to directly manage the non-instructional aspects of their schools as well, including schedules, finances, facilities management, and student safety and discipline, all while maintaining a positive, engaging school culture and climate. How can school systems make principals’ roles more manageable while also ensuring that teachers are receiving the support they need to continue improving classroom instruction for their students? A new paper from New America’s PreK-12 Education Policy program, From Frenzied to Focused: How School Staffing Models Can Support Principals as Instructional Leaders, explores approaches to solving this dilemma by examining three public school districts which employ promising, yet varied, “new school leadership” (NSL) models with a goal of bolstering principals’ ability to focus on instructional leadership, including supporting teachers’ classroom practice. What roles and responsibilities do principals perceive as part of their job as instructional leaders? How does creating additional capacity on school management teams affect principal ability to focus on instructional leadership? Does adding a NSL impact schools, and particularly teacher practice, in other ways? What conditions and supports can bolster the impact of NSL models? What are potential challenges and pitfalls to designing and implementing impactful NSL models? The paper finds that the new school leadership models in these districts have clear benefits. But, for a variety of reasons, they are generally not building sufficient staff capacity to address the myriad functions necessary to make schools successful, including helping principals focus on supporting teacher practice. 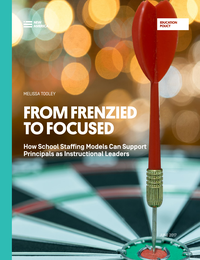 From Frenzied to Focused explores these reasons, and offers key considerations for states and districts interested in rethinking their school staffing models to better support the needs of its staff and its students, including recommendations for how to fund and encourage impactful work in this area.